SilverStone's standard FT03 is one of the best micro-ATX chassis out there, combining a 90-degree-rotated layout with an ingenious layout that fits together like a game of component Tetris. The FT03-Mini looks to go one better, using a mini-ITX design to squeeze a full- power system into as small a container as possible. With a total volume of just 17.6 liters, the FT03-Mini is the smallest case on test and has close to half the volume of its bigger sibling. Its vertical design also gives it a tiny desktop footprint of just 189 x 235mm. 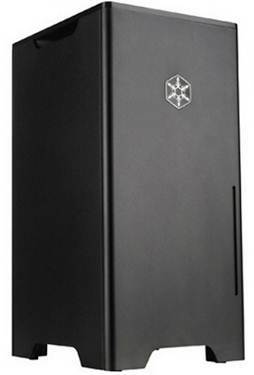 As usual for a case under SilverStone's Fortress brand, styling is restrained and minimalist, with all four sides of the case finished in gorgeous aluminum that's been anodized and sandblasted. Look underneath, and you'll find a clip-on dust filter protecting the case's only fan mount-a 140mmfloor mount equipped with one of SilverStone's own 140mm Air Penetrator fans. 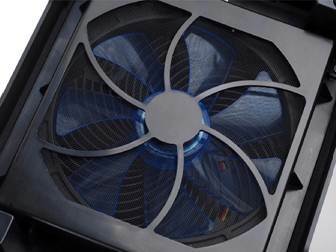 These fans use a special frame to channel air into a tight cone, allowing effective airflow to penetrate deep inside the chassis. On top, the motherboard rear I/O and PSU exhaust are recessed slightly. This is to allow cabling to be tucked beneath the case's detachable plastic roof grille, keeping cable mess to a minimum. Meanwhile, the plastic fascia clips firmly into place, with a front panel sitting in a raised central section, and featuring two USB 3 ports, power and reset buttons, and microphone and headphone jacks. Taking the FT03-Mini apart is a bizarre experience for the uninitiated, however, as all three detachable panels (the front, rear and side) can be removed without the use of a screw or clip. All are secured by push-pins, and the arrangement of these makes it impossible to fit the wrong panel in the wrong place. Each panel clicks satisfyingly into place, resulting in the case’s smooth, sleek and tool-free exterior. It also makes taking the FT03-Mini apart a doddle; pulling the panels free takes seconds, revealing the core chassis' framework beneath. As with SilverStone's RV03, the motherboard mount has been rotated by 90 degrees, with the rear I/O pointing upwards. 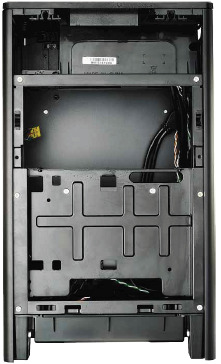 The board is secured to the motherboard tray above the case's one non-removable exterior panel, with a drive bay cage fitted into the framework along the opposite side of the case. Fitting the motherboard is simple in an empty case, with the other hardware subsequently added around the board. The front­panel cables are also perfectly cut to loop around the board before connecting, and the floor- mounted 140mm cooling fan blows air directly through the heart of the chassis. However, there have been compromises made in order to fit a decent-spec PC into such a small box. Most importantly, the FT03-Mini is only able to accommodate an SFX-sized PSU; this isn't an issue if you're buying a new system, but it is a problem if you plan to use old ATX parts. SFX PSUs are much smaller, but also offer lower peak wattage as a result. However, even an overclocked mini-ITX system equipped with a GeForce GTX680 2GB won't pull more than 400W under peak load, and SilverStone provided us with its450W Strider SFX PSU for our testing. As the PSU is fitted above the motherboard, CPU cooler headroom is limited to just 78mm, but this is still sufficient for stock coolers or low-profile coolers such as our test system's Zalman CNPS8900. As the PSU is positioned directly over the motherboard, connecting cables is simple; the PSU is smaller than the board, and access to the edge-mounted power connectors is unhindered. Connecting power to drives is a little more difficult, though, and you'll need to wire up your storage devices before fitting the removable drive cage. However, there's only room for a slot- loading slim line optical drive, a single3.5indriveand a pair of 2.5in drives. Meanwhile, a graphics card up to 254mm long can sit behind the front of the case, separating it from the rest of the FT03-Mini's internal machinations. However, as it's almost flush with the side panel, it benefits little from the 140mm fan below, which is mounted centrally. Sadly, with our test system fitted, the FT03 trailed when it came to cooling. ACPUdeltaT of 48°C was stable if unspectacular, while a GPU delta T of 58°C matched the cooling of the similarly equipped Lian PC-TU200. Both trailed the BitFenix Prodigy significantly, especially with GPU cooling - the Prodigy was 10°C cooler. The SilverStone FT03-Mini's ability to accommodate full-sized hardware (with some concessions in the form of the SFX PSU) into such a small space is a remarkable feat. However, at over $150, it also has a high price tag, and unspectacular cooling to boot. If you're looking for the smallest possible gaming PC then the FT03-Mini is the easy choice. If you're looking for flexibility, features and cooling, however, the Prodigy wins.